Vanga species look so different from one another that only ornithologists, scientists who study birds, and DNA comparisons have been able to find enough similarities among them to realize that they are related species within one family. 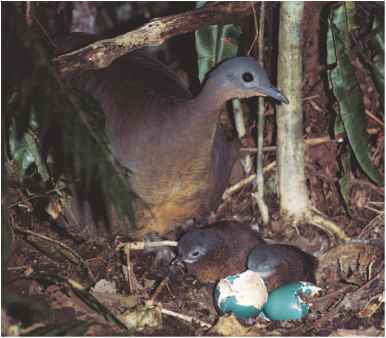 Males and females of most vanga species have different colors and patterns. Colors among species vary enormously. The three closely related species Lafresnaye's vanga, Van Damm's vanga, and Pollen's vanga, are similar in appearance, both males and females sporting differing patterns of sharply defined black, white, and gray. The head may be entirely black or only partly so, the rest white. Bernier's vanga is simple in design but striking in appearance, with a glossy black body and head, white eye, and blue bill and legs. The female outshines the male, her entire coat being a bright red-brown with narrow, black streaks. Perhaps the most beautiful and memorable of all vanga species is the blue vanga, with its vivid ultramarine blue head, wings, and bill, white underside, white eyes enclosed by a black mask, and a blue and black tail. As a whole, vangas are small birds. The largest species are the sickle-billed vanga, with a beak-to-tail length of 12.5 inches (32 centimeters) and a body weight of slightly over 4 ounces (114 grams); the helmet vanga, with a length of 12 inches (31 centimeters) and a body weight of 3.8 ounces (108 grams); and the hook-billed vanga, with a length of 11 inches (29 centimeters) and a weight of 2.5 ounces (67 grams). The smallest species are the red-tailed vanga and Chabert's vanga, both 5.5 inches (14 centimeters) long and weighing only 0.5 ounces (14 grams), and the blue vanga, 6 inches (16 centimeters) long and weighing just under 1 ounce (28 grams). Head-and-body lengths for other species run 8 to 10 inches (20 to 25 centimeters). The original beak of the ancestral vanga species went through some extreme shape changes in descendant species. The helmet vanga sports a big, casque-like (KASK-like) bill reminiscent of the bills of hornbills or toucans. The sickle-billed vanga has a thin, almost needle-like bill, curved downward, that may reach nearly 3 inches (7 centimeters) in length. The bill of the hook-billed vanga is straight, with a small, downturned hook at the end of the upper bill. Van Damm's vanga, Lafresnaye's vanga, and Pollen's vanga share a very unusual bill type. The bill is thick, strong, deep vertically and narrow horizontally, giving it a distinctive chisel shape, and fit for the chisel-like work of prying bark from trees, prior to yanking insects out of the wood.